Catch up with the TLC sponsored Southern Lions’ performance at the recent Bangkok 7s tournament. Home / Blog / Catch up with the TLC sponsored Southern Lions’ performance at the recent Bangkok 7s tournament. Read about the Southern Lions’ march to victory at this prestigious, international 7s rugby tournament. At TLC Surf Treatment, we’re huge rugby fans. So much so that we’ve supported some of Australia’s premier 7s players by becoming one of the proud sponsors of The Southern Lions, a local team making waves in the 7s scene. The Southern Lions took part in the 2014 7s tournament in Bangkok, over the weekend of the 8th and 9th of November and in this article, we’ll take a look at their sterling performance over the course of the tournament. 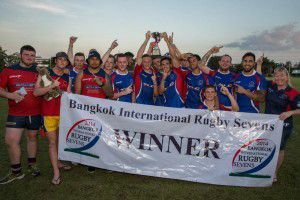 The 2014 Bangkok 7s tournament, afforded our boys the opportunity to play against some of the best teams from Thailand, Malaysia, Laos and the rest of Australia. The entire tournament took place in the Bangkok Patana School Sports Complex, which boasts three impressive playing fields and a sizeable grandstand. The Lions team for the tournament represented some of the greatest talent that the side has to offer, including, Cody walker, Teegan Minkley, Declan Pegum, Eli Greaves, Duncan Schutte, Jamie Pascoe, Sam Price, Sonny Kerr, Norton Beech, Lima Eastwood, Mata Mcgrath and Jordan Pieira. Coach Willie Lio couldn’t make the trip, so Conan Alai took his place at the helm of the team. The Lions fought hard for consistent victories throughout the pool stages of the event, losing only to the Phuket Vagabonds, a team of ex-pats that featured the likes of ex-NRL winger Sandor Earl. Regardless, the Lions had earned their place in the finals and they had set their sights on the trophy. The Lions went on to conquer all in the semi’s leaving a trail of jaw-dropping tries and disappointed opponents in their wake. The time for the Cup Final had finally arrived. It was the Lions vs KPM, a team from Malaysia who had managed to conquer the Phuket Vagabonds in their pool game. The stakes were high, with KPM scoring three tries and the Lions scoring two, leaving the half-time score at 12-17. In the second half, KPM blazed across the field for another 2 tries, which the Lions quickly answered by scoring two of their own. In the last minute, KPM was relentlessly attacking, looking for the winning points. The tension was tangible, but the Lions managed to keep their wits about them. They managed to turn the ball over and the game ended with a long range, winning try by Teegan Miley. A huge congratulations from the TLC team goes out to each and every player involved, and particularly to Teegan Minkley for being named player of the tournament. We wish all the players a bright future with the continued support of TLC surf Treatment.